Modest Mussorgsky wrote both the libretto and the music for Boris Gudonov, a masterpiece of music and theater. Presented at the San Francisco Symphony’s Davies Hall, June 14 – 17, 2018, there were at least sixteen artists involved in the creation of the multi-media, semi-staged production. This includes artists: Maestro Michael Tilson Thomas, Conductor and Music Director of the SFS; Ragnar Bohlin, SFS Chorus Director; Andrew Brown, director of the Pacific Boy Choir; stage director, James Darrah; lighting designer, Pablo Santiago; video designer, Adam Larsen; associate video designer, Hana S. Kim; scenic and costume designers, Emily Anne MacDonald and Cameron Jay Mock; choreographer, Christopher Bordenave; assistant lighting designer, Alexa Oakes; assistant to the director, Sergey Khalikulov; production stage manager, Angela Turner; assistant production stage manager, Julie Chin; supertitles, Ron Valentino; Russian diction coach, Yelena Kurdina. This list does not include the full cast, the members of the two choruses, the dancer/actors, or the IATSE Stagehands or Theatrical Wardrobe members who make a production click along backstage so that onstage, theater can happen. The effect of this network of collaborations was enormous and impressive. 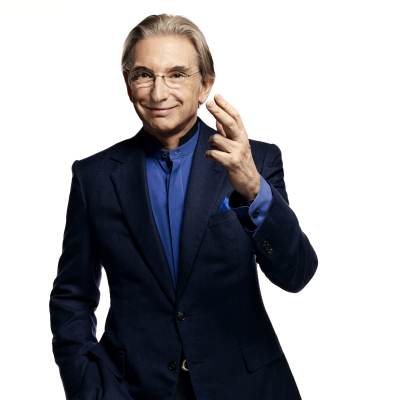 To describe the semi-staged productions presented by Michael Tilson Thomas: The orchestra is on stage. The cast of the opera performs in front (downstage) of the orchestra, on stairs or a ramp that goes alongside of the orchestra and across the back of the orchestra (upstage and literally up–on a higher level than the orchestra). The walls on the sides of the orchestra were wrapped in order to project images and video onto them. At the beginning of the opera, Russian texts/Cyrillic letters were projected as the six dancer-actors crawled on the stage floor or stooped over to paw through pages of books and papers. Other times, the projections were multi colored, looking like colored oil on slides. Watching the projections change was fascinating and rarely took my attention away from the music, singing, acting, and general progress of the plot. The cast of dancer/actors were highly skilled movers and as a group had a strong presence on stage. They took various roles. Sometimes they were peasants, sometimes vicious ruffians. The director did not spare them or even the leading singers from doing the physical work of fighting or torturing another actor. There were a few times this audience member could not figure out why they were doing what they did. There was a point when they each picked up a red-orange piece of cloth, kept it in hand, and waved or flipped it around. That action’s peculiarity was its main distinction. Could it have symbolized celebration of Boris’ ascension to Czardom? Only a guess. The actions and the fabric did not seem to add up to a coronation or to a protest. No one person is given credit in the program for the overall vision of the presentation or for coordinating the artists accomplishing so many different aspects of the production. Without knowing for sure, it seems most likely that MTT called together the director and designers who could put his ideas into real time onstage. It is a huge achievement. On the SF Symphony’s video of brief interviews with MTT and the costume designers, the costume artists describe taking great efforts researching the costumes of Boris’ era. In performance, some costumes created a sense of time and place and added power to seeing these particular people going through terrible experiences–some of their own making. At the same time, Boris Gudonov (Bass, Stanislav Trofimov) and Prince Shuisky (Tenor, Yevgeny Akimov) wore gray, slightly baggy, 20th century, business suits. Why? Boris also wore glasses and a wristwatch. That could not have been an accident with so many people back stage and in the cast available to remind him to take them off. Were they generic, gray suits or were they meant to symbolize a particular time? Were they meant to reflect on Khrushchev during his visit to the US? How would that contribute to the development of the opera? It’s puzzling. Andrei Shchelkalov (portrayed by Baritone, Aleksey Bogdanov ) also wore a suit. His had a Victorian aura perhaps only because, as I remember it, it was dark and had a vest. The story of Boris Gudonov is a puzzle itself. The history is murky; nothing is clear except confusion and danger. An imposter, dressed in a glittering white costume, takes the throne at the end. it is another example of the lies that become reality in the era and the opera. It is not a satisfactory resolution of the rule of a Czar said to be a monster, but history seldom has tidy resolutions. The impact of this production was powerful and alarming: an oncoming MACK truck of music, drama, historical horror. In his video interview, Michael Tilson Thomas calls it a “sonic spectacular.” San Francisco Symphony’s magnificent production was most definitely that. 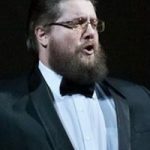 This entry was posted in Hedgehog Highlights and tagged Aleksey Bogdanov, Boris Gudonov, Davies Hall, Michael Tilson Thomas, Modest Mussorgsky, San Francisco Symphony Chorus, San Franciso Symphony, Stanislav Trofimov, Yvegney Akimov on June 27, 2018 by Leslie.